The Gene Pulser Xcell eukaryotic system provides a modular electroporation system with a focus on most eukaryotic cells, such as mammalian, as well as plant protoplasts. 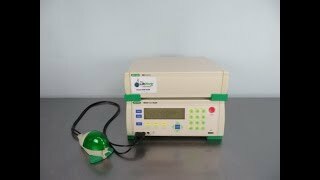 This electroporation system comes with a capacitance extender, helping to extend the time constant of the pulse, for a range of 25–3,275 µF. When used with the square pulse, this module makes it possible to use with low resistance media by providing a large capacitor. The Gene Pulser Xcell delivers up to 3000 V and comes with a Shock Pod cuvette shocking chamber with easy one-handed operation. X-Cell cuvettes, available from Bio-Rad, offer a great pulse delivery method, are sterile and have several gap widths to choose from. This Eukaryotic Electroporation System is compatible with any electroporation buffer, and comes with a convenient preset protocol library, including most bacterial and mammalian cell types, immortal and primary cells. The controls for the Gene Pulser are simple to use, with a graphical interface, and the capability to store up to 144 user defined programs, either manual entry or editing for all parameters into existing programs, as well as an optimizing protocol that lets you find the ideal condition through incremental steps. The XCell will even store the parameters for up to 100 experiments for recall. These BioRad GenePulser units have been fully inspected and come with clean bill of health. All of our lab equipment comes backed with our standard warranty. All of our lab equipment comes backed with our standard warranty.